It's a pleat party this winter. Pleats were seen on the runways in Paris for Fall/Winter 2011 from the likes of Sonia Rykiel to Jill Stuart. 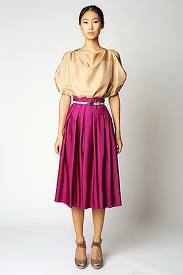 Wear a pleated dress or skirt to your next holiday party. Keep the length in mind. The 2011 trend is keen length or mid calf since this is a throwback look tribute to the 1940's. I love the tiny waist look paired with a skinny belt in contrast to the skirt. Ankle heels and kitten toe are a great way to complete the look. Think vintage Chanel when picking a blouse or collarless jacket to pair with the pleated skirt. Check out these Privy finds to conquer this holiday look. Whether a work party or a night out, pleats are the way to go this holiday season. This black, shorter, pleated skirt is a great way to achieve this trend for a night out. Pair it with tights and a fitted sweater for a party look. Found here from Nasty Gal for $88. 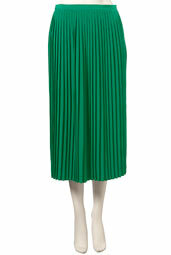 For a more conservative holiday look, I adore this gem tone green, calf length skirt from Top Shop.